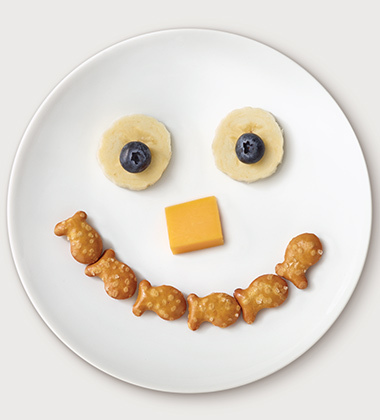 Banana and blueberry eyes pair perfectly with a cheese cube nose and a smile made with pretzel Goldfish Made With Whole Grain pretzel crackers. American cheese, sliced into 1/2 oz slices	 6 oz. 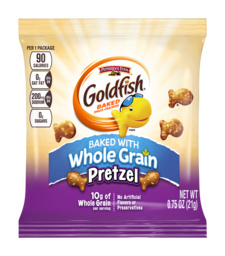 Goldfish® pretzel snack cracker with a traditional pretzel flavor baked with 10 grams of whole grain per serving with the added benefit of no artificial flavors or preservatives. This is a great snack that kids love, in a single serve .75 ounce portion size! USDA Smart Snacks in School Competitive Food Compliant. 1. Arrange 24 small plates on a large tray for assembly. Place a 4 oz bowl or cup ontop of each plate. 2. Cut bananas into 1/2 thick slices. Set aside. 3. Cut the 1/2 oz cheese slices into 4 equal sized cubes. Set aside. 4. Put 1/8 cup banana slices (4 slices), 1/8 cup blueberries (#30 scoop), and 1/4 oz cheese cubes (2 cubes) into each serving bowl. 5. Put 1 pouch (0.75 oz) of Whole Grain Goldfish Pretzels on each plate on the side ofthe bowl. 6. CCP: Serve immediately, or cover and refrigerate at 41 degrees F until ready to serve. 7. Post a picture of Fruity Smiles or display a sample plate of Fruity Smiles on the serving line to inspire students to make their own. For a complete reimbursable after school snack, offer this menu idea with 1/2 cup fruit juice or 8 oz of milk. Meal Contributions: 1 oz equivalent grains, 1/4 oz meat/meat alternate, and 1/4 cup fruit.